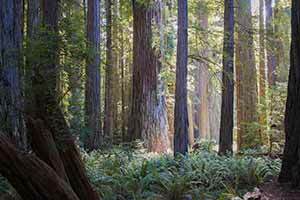 Jedediah Smith Redwoods State Park has the most scenic redwood forest. Take the half-mile walk around the cathedral-like Stout Grove, drive up Howland Hill Road (a one-lane dirt road, not for RVs), and if you’re up for a longer hike, try the five-mile Boy Scout Tree Trail. 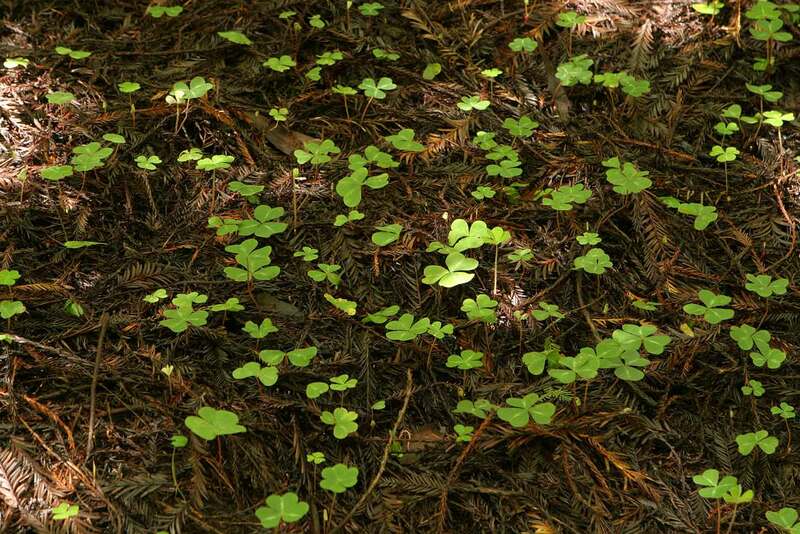 In Prairie Creek Redwoods State Park, the 11-mile Miners’ Ridge and James Irvine loop is the best all-day redwood hike. The Brown Creek Trail is also very impressive. 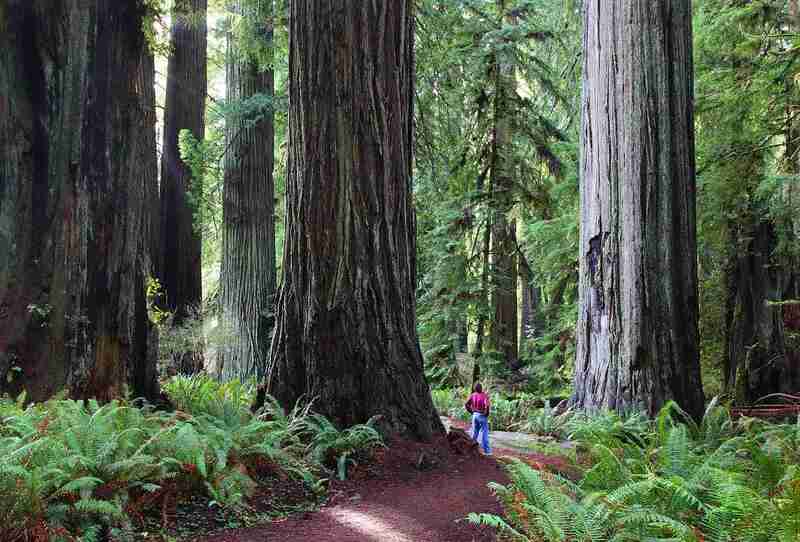 The 30-mile-long Avenue of the Giants in Humboldt Redwoods is the classic redwood drive. I highly recommend the four-mile side trip down Mattole Road (a narrow, bumpy paved road through some of the world’s tallest trees), which leads to half-mile walks in the Rockefeller Grove and also in the Big Trees Area. Currently, the tallest tree in the world is the Hyperion Tree in Redwood National Park. The tree is not accessible by trail and its location is kept secret to prevent visitors from trampling the soil around the tree. The tree is on a hillside, not in the Tall Trees Grove. 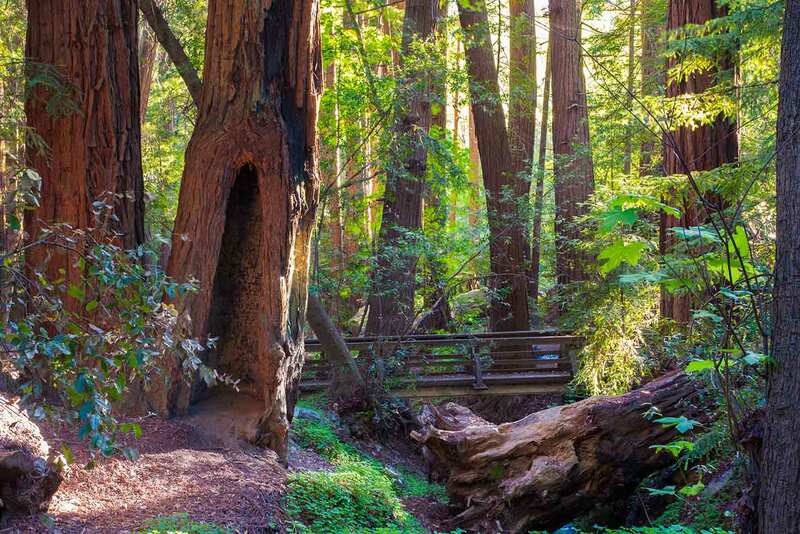 California’s redwood forests are famous for being home to the tallest living things on the planet, but there’s much more to these extraordinary woodlands than the size of the trees. 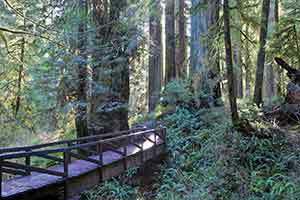 At their best, redwood forests are suffused with a sense of openness and serenity. Sun-dappled, elegantly fluted tree trunks shoot straight as an arrow into the sky, while below are burbling streams, spectacular fallen trunks, and a lush accumulation of ferns, sorrel, moss, and lichen. Many redwood trails are also a pleasure to walk because they’re so well constructed: wide, smooth, and easy to walk, with a springy mud-resistant carpeting of needles, and bridges to span even minor obstacles. The forest is cool in the summer but rarely below freezing in the winter, and (except for Muir Woods) the parks are almost never crowded. 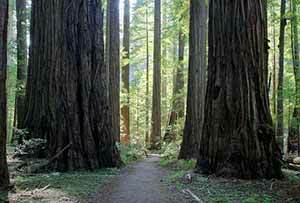 California has six major redwood parks, each with its own character. Prairie Creek, for example, is an aggressively lush and green coastal forest, while Jedidiah Smith is filled with light and is the most photogenic. 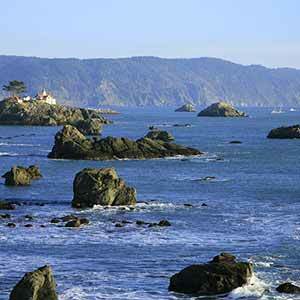 Del Norte has a unique location on a prominent coastal bluff, while Redwoods National Park occupies a large and heavily-logged inland valley. Humboldt Redwoods is best known for its dark, dense, and flat lowlands, and Big Basin has the mixed-species woodlands typical of southern redwood forests. Of these six parks, Jedediah Smith and Prairie Creek clearly have the best-preserved ecosystems and most scenic hikes. 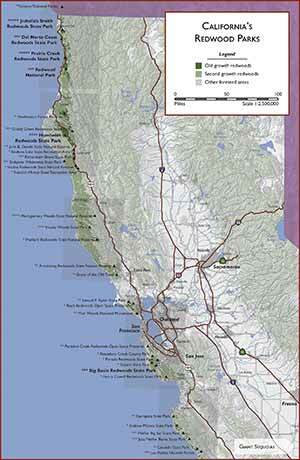 At least 15 other parks have small old-growth groves and should not be overlooked. 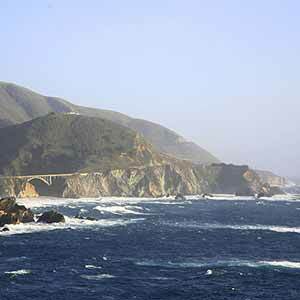 Many of these parks are just as enjoyable as the big parks and, in addition to outstanding redwoods, offer a wide variety of other scenery, from the dramatic coastal bluffs of Big Sur to the rolling farmlands of the Anderson Valley. Within each park, the largest trees are normally found in the flat bottoms of creek valleys, where the soil moisture is the highest. 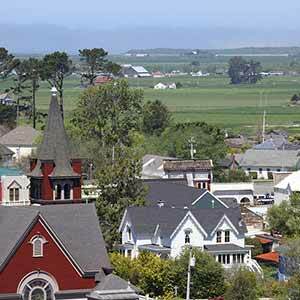 These alluvial flats host the spectacular, cathedral-like groves that redwoods are famous for. Most redwood parks are centered around an alluvial flat that originally inspired the creation of the park. These alluvial flats, which usually aren’t very big to begin with, are often the site of highways and parking lots, making it difficult to appreciate their unique and serene character. 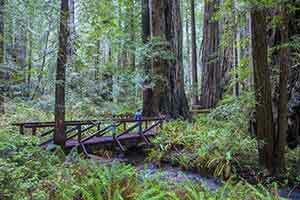 The most striking example of this type of forest is the Bull Creek area in Humboldt Redwoods State Park. Uplands tend to have fewer big redwoods and more trees of other species. 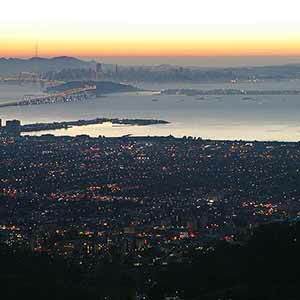 The difference is more pronounced in drier and hotter parks like Big Basin and Humboldt Redwoods. On the other hand, in Prairie Creek, Del Norte, and Jedidiah Smith parks, large redwoods can cover the hills right up to the ridgelines. Uplands can make great hiking because the hills make the trail more interesting. 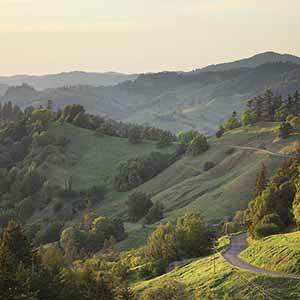 A great example of redwood uplands is the Miners’ Ridge Trail in Prairie Creek State Park. Redwood forests generally get more scenic as you go north. The northernmost parks tend to have the biggest trees and the lushest, healthiest appearance. The southern parks tend to be drier, have less greenery and more dead tanoak leaves on the ground, and often have a a dense layer of shrubs that obstructs views of the redwoods. On the other hand, the southern parks have better weather and there’s more to do after the hike. 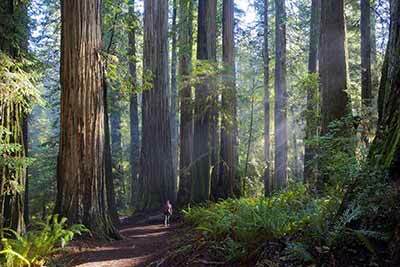 The tallest redwoods are found in Redwood National Park, Humboldt Redwoods, and Montgomery Woods. However, the lists of tallest trees that can be found online are no longer maintained and are out of date, since the large numbers of people going off-trail to see and climb the trees was causing significant damage. 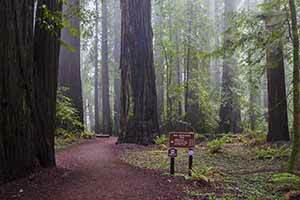 All the redwood parks can be visited year-round. Most people visit in summer, which is understandable — it hardly ever rains, all the trails are open, and with the long days you can spend more time outdoors. And although the campgrounds fill up most summer weekends, none of the parks (except Muir Woods) ever get crowded, even on major holidays. However, keep in mind that the same fog that rolls in through the Golden Gate 300 miles to the south also keeps the North Coast parks cloudy and under 70 degrees for most of the summer. Fall is also a good time to visit. The weather doesn’t turn really rainy until mid-November and there are fewer visitors and fewer cloudy days than in summer. Although it’s not quite New England, Humboldt County gets a little fall color as the maples turn yellow, usually from mid-October to mid-November. For sheer scenic beauty, winter is the best time to visit the redwoods. If you’re willing to take a chance on the weather, the payoff can be a truly special experience; all of my best visits to the redwoods have been in the winter. The rain washes the dust off the foliage, the woods are filled with the sound of rushing creeks, and when it’s sunny, the light has a sweet, gentle quality because the sun is always low in the sky. When it’s not sunny, the frequent mist, fog, and drizzle really enhance the scenery. And although the parks aren’t really that busy in summer, there’s a certain serenity that you can only get in winter when you have the park practically to yourself. However, even if it’s not raining during your visit, trails and roads can sometimes be closed due to wind or water damage. Spring is best known for rhododendron blooms. The rhododendrons don’t all bloom at the same time; maybe I haven’t been timing my visits right, but I’ve yet to see any trail with more than a few isolated trees in bloom. Trees in warmer locations, such as by the side of the road, seem to bloom a few weeks before the trees under the old-growth canopy. The blooms start in mid-May and can sometimes be seen in cooler locations like the Lady Bird Johnson Trail as late as early July. Click on the links below to view the regional, park, and hike pages. Parks are listed from north to south. Each park and trail has been rated from one star (pretty good) to five stars (world class) based on how enjoyable it is overall, with an emphasis on redwoods. Trails are rated for scenery, not safety. The fact that a trail is discussed or shown on a map on this site does not imply that it is safe for all visitors, even under ideal conditions. Furthermore, trails may not be well-maintained and may have become impassable since the last time I walked them. Notices may not posted at the trailhead when this happens, so always ask about trail conditions at park headquarters before your trip. Trails and some roads were mapped with a handheld global positioning system (GPS) receiver. Roads outside of park boundaries are mostly derived from county or USGS street data and are therefore more likely to be outdated or contain inaccuracies. 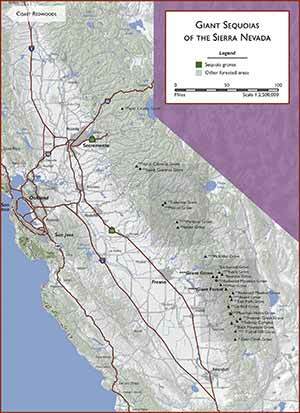 Most other features are derived from GIS data and satellite imagery provided by the USGS and/or the USDA.